Dayasatakam by Swami Desikar on LORD VENKATESHWARA expounds this truth . He performed the Caramakainkarya for Srivaishnavadasa. 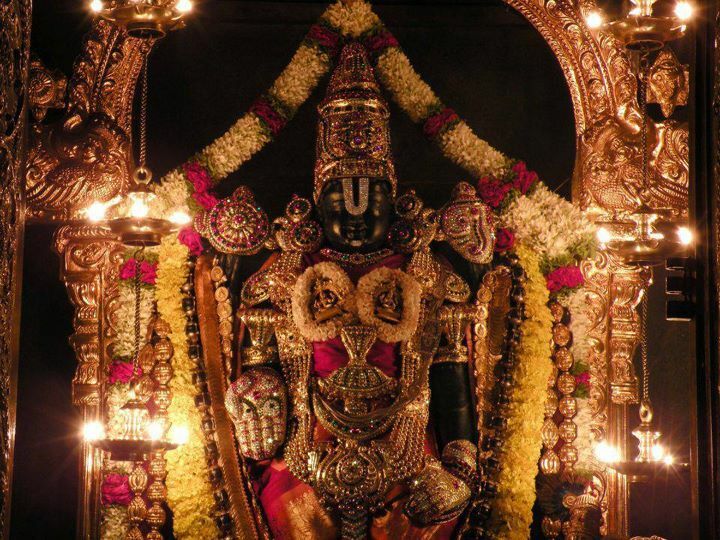 Swamy Ananthazhvan with the instructions of Jagatha Acharyar Swamy Ramanujar had taken the task of serving Lord Venkateshwara at Tirumala . His Acharyar bhakthi was well noticed .His fame spread far and wide to the southern parts of India for his Acharya bhakthi in moving to Tirumala and serving the LORDSHIPS with pure devotion during those olden days . Many Srivaishnava disciples were keen to meet him and to get his blessings. Hence they undertook a pilgrimage to the seven Hills from Srirangam . On their way, they were taken care by of a chieftain by name Valarttan Mangalamudaiyan in a village of the same name. He was pious and charitable and endowed with material prosperity. After serving prasada looking at their devotion to LORD the chieftain started following them to Tirumala . He begged them to allow to join them and take blessings of the mahaan Swami Anathazhwan. This train of thoughts occurred in split of seconds before he could hit the ground and miraculously he landed gently as if by a parachute his firm grip on the pole in tact . This incident took place 30 years ago . The Annual Brahmotsavam for Lord Varadaraja was being celebrated with piety and fanfare at the temple town of Kancheepuram. The big day “Garuda Sevai” is conducted in Kancheepuram in the Tamil month of Vaikasi is of special significance. The Lord of Lords was showering his abundant mercy on all the devotees assembled . A staunch devotee of Ahobila Jeeyar was fortunate to undertake the divine service to hold and carry the Royal umbrella that overspreads on the Lordships as the procession proceeds in the streets of Kancheepuram. The festive mood is a fortune to watch . The procession was lead by the Temple Elephant , a cow , a horse and the fire crackers specialists . Few thousand thronged to witness the Lordships in escastcy . Apperance day of Madhurakavi Azhwar …………………..
Let us recollect their devotion to Acharyar and the great Lordships on this wonderful day . Acharyar Varadaguru the great Acharya had the deepest bhakti to Lord Varadaraja of Kanchipuram One night when he was serving ” LORD” in an ecstatic mood, the priest brought very hot milk to the Lord as offering . Acharyar Varadaguru was deeply distressed that such hot milk would burn the tender tongue of the Lord! He stopped the priest from offering the hot milk and began cooling it down until it was warms enough to be offered. The Lord himself was moved by the Vatsalya bhava of Varadaguru and called him ‘Amma’ – my mother! From then onwards Varadaguru became Nadadoor Ammal. After this episode, in a dream one night, Lord Varadaraja commanded Ammal to erect a Mantapam for His Vasantotsavam. Accordingly Ammal fulfilled the Lord’s desire, just as a mother would fulfill the wishes of her son in spite of difficulties. Another glorious pastime remains to be cherished . 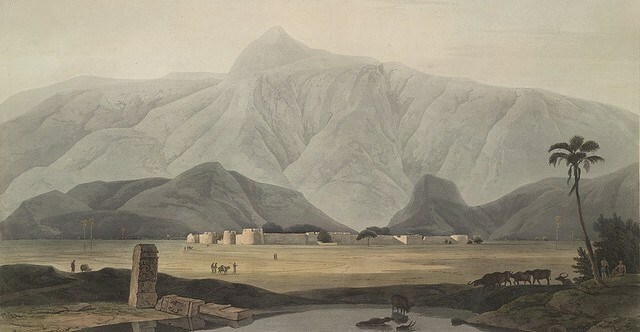 Once Ammal and his disciples undertook a pilgrimage to Tirumalai hills. The graceful personality and humility of Acharyar attracted the people there.. A Chieftain Kandavaran was the leader of that Lada race . He was annoyed and irritated to see the crowd falling the the feet of Acharyar. He decided to disturb them. With his mantric power he made the disciples unconscious. Ammal meditated and chanted the Sudarsana maha mantra and his own composition ‘Hetipungavastotram’ and broke the spell. The angry Kandavaran called Ammal for a debate and when defeated surrendered to the Acharya himself. The benevolent guru not only excused him but also made him a Srivaishnava by offering him Panchasamskaras. With the money offered by Kandavaran, Ammal established a beautiful village and named it ‘Ladagraharam’ and continued his journey. On the way, the Lord himself came as a young brahmachari and appeased the hunger of the pilgrims with curd and rice. The sacred TIRUMALA Hills consisting of seven peaks is considered to be seven-hooded. Blessed are the devotees who are fortunate to have his darshan . There are countless devotees who have served the LORD since ages .One such great devotee was Swamy Ananthazhwan an ardent disciple of Swamy Ramanuja . 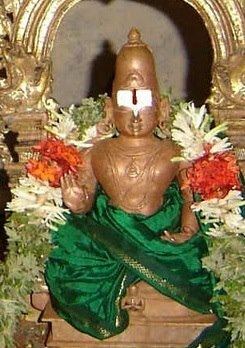 As per Swamy Ramanuja’s directives he served the LORD few hundred years ago .There are several pastimes of Swamy Anathazhwan with Lord Srinivasa . One divine pastime is memorable as Lord himself accepts to become Swamy Anathazhwans disciple . Knowing about the initiatives taken by Swamy Anathazhwan in organising the temple rituals with religious fervor few devotees decided to trek the hills and have darshanam of Lord and seek the blessings of his dear devotee too . The Srivaishnavites were walking from Srirangam and it was a very long journey . While ascending the Hills, coming from they were feeling tired and had to take some rest . Completely exhausted they were perplexed how could they complete their pilgrimage. All of a sudden a young lad appeared before them . The boy was appearing with divine tejas . With srivaishna Urdhva pundram he was almost looking like vamana avatara brahmachari . He offered his humble obeisances and said . Oh swamins ! Adiyen has brought some temple prasada for all of you .Kindly honor the same and please feel comfortable .The srivaishnavites being orthodox were initially impressed with the divine boy .However one Elder person among the group wanted him to introduce his lineage and his Acharyar whom he was initiated . The divine lad he was , smiled at the simple question . He proudly replied that his name was Madhurakavidasa and his Acharyar was Swamy Anathazhwan who is serving Lord in all ways .It was his Acharyars instructions , he had walked down the sacred hills to handover the prasada coming to know about their visit . He further expressed that the Prasada was coming directly from the temple which was handed over to him by Swamy Anathazhwan to be given to them . A bit surprised , the elders said ..
Its nice to know about your association to Swamy Anathazhwan . But we wish to hear from you about his glories . They liked the divine lads confident answer . However the Srivaishnavas then questioned the youngster how his taniyan made no reference to Ananthazhvan’s relation to Swamy Ramanuja. The divine boy smiled and replied Swamins ! 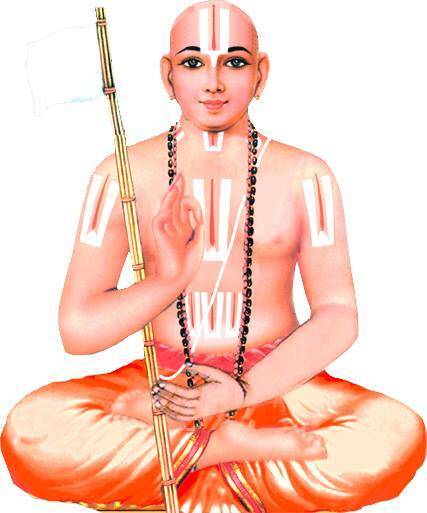 Actually there are two Thaniyans in praise of adiyens Acharyar Swamy Ananthazhvan, one referring to the glory of his divine personality and another referring to his connection with Swamy Ramanuja. Sathutha manga sandaryam Anantharyamaham Bhaje.. The Srivaishnavas were convinced that the divine boy was a true disciple of Swamy Ananthalvan . They honoured the prasada with relish . They thanked the boy for his affection and love and blessed him . The divine boy took leave of them and ascended the Hills welcoming them to join him . Slowly, the Srivaishnavas ascended the Hills and walked into Swamy Anathazhwans ashram . Swamy Anathazhwan was overjoyed to recive the guests from Srirangam . They offered their obeisances and thanked him for the kind courtesy in sending the maha prasada down to the Hills They appreciated the young boy for his kindness and hospitality . They praised the boys intellect and kindness and expressed their gratefulness to Swamy Ananthazhvan for having sent prasada through one of his bright young disciples. Swamy Ananthalvan was bewildered. Amazed to note the divine leela , he was in total dark . He realised that it was his LORD who took the pains to walk down with the mahaprasada to his devotees . With tears , he wished to know about the divine lad .The Srivaishnavas explained about the divine glow the boy exhibited . His majestic recitation of the Thanians was memorable .. The boy was so down to earth serving the prasada They informed that the boy introduced himself as Madhurakavidasa and had recited two slokas in his praise and as they were just trekking behind him up to the hills safely . They said that the boy went inside the temple citing some pending works. Swamy Anathazhwan pleaded them to recite the verses the boy had sung .. They recited the two verses before Swamy Ananthazhvan.The entire assembly was wonder struck. Swamy Anathazhwan was in tears . They realised that the Lord had declared himself as Ananthalvan’s disciple and had chosen the name Madhurakavidasa .Even though there were so many other Acharyas the second verse showed that it was Ananthazhvan who could be fittingly considered equal to the Lotus feet of Swamy Ramanuja. Since then the paduka (sathari) at the shrine of Swamy Ramanuja sanctorium up the Hills came to be known as Ananthazhvan since then the two verses became famous as the Thaniyans in praise of Swamy Ananthazhvan…. Once Madhurakavi Azhwar undertook an pilgrimage to Ayodhya. He was very moved by the beauty of deities of Lord Rama, Sita Devi, Lakshmana & Anjaneya and decided to stay in Ayodhya for sometime. During his stay, one night he saw a bright light in the sky emitting from the southern direction . He couldn’t comprehend if it was a bright star, a forest fire or anything else. Amazed with the strange happening , he decided to follow the light and see it for himself. Unmindful walking long distances , he followed the light . After days of voyage, he finally reached Azhwarthirunagari a remote village and the light suddenly disappeared .He was surprised at the phenomenon. He enquired from the villagers about anything strange happening in their village assuming the dazzling light could have some prophecy too . The villagers replied in negative, but expressed that a boy has been meditating under a Tamarind tree for past 16 years without even opening his eyes. He had crawled to the tree as a baby 16 years back and remained in the tree thereafter. Madhurakavi Azhwar was amazed with the villagers expression .He decided to see the child for himself. Azhwar goes close as near to the tree and finds the divine child with tejas . Eyes closed and meditating the boy was glowing with radiance which was what he saw at Ayodhya . The place was filled with divine aura and true the boy was looking too divine as much as Lordships themselves .. Azhwar attempts to question the divine boy about what is True knowledge and gets convinced with his instant replies . He immediately accepts the divine boy who is none other than our great Swamy Nammazhwar as his ACHARYAN Sri Madurakavi AzhwAr becomes an ardent disciple of NammAzhwAr and serves him with utmost devotion . With all humility he submits the 11 verses of the grand KaNNinunchiRuthAmbhu glorifying his Acharyan Swamy NammAzhwAr / Sri SaTakOpar with all humility equating to Lordships . A devotee can dwell and enjoy these verses for ages on the divine works of Madhura kavi AzhwAr’s grand …..
( I do not know of any God other than my AchAryan, Swamy NammAzhwAr).After NammAzhwAr departed from this earthly world to srivaikuntam , MadhurakaviAzhwAr was worshipping deity of Swamy NammAzhwAr with deep devotion which he consecrated and performed ThiruvarAdhanA and uthsavams in his honour. Impressed by Swamy NammAzhwAr’s works he wanted to stage NammAzhwAr’s works in front of other scholars .Azhwar used to contemplate on the divine knowledge shared by Acharyar . Vaikaasi visaakam the appearance day of Swamy NammAzhwar was celebrated in a grand manner . One particular year, when Swami Madhurakavi azhwar was taking azhwar’s deity in a procession during the celebrations, few poets from Madurai Thamizh Sangam objected to Swami Madhurakavi azhwar and said . You are worshiping Nammazhwar who is a just a ordinary devotee not Perumal and reciting verses glorifying him ..Are those verses “sangam” certified? and authenticated by the great Madurai Tamil Sangam as “ the original and of the highest quality”? and is he really qualified enough to translate the Vedas into tamil ”? Azhwar was completely disappointed hearing these critics . He politely went to Azhwar’s sannidhi and pleaded “Azhweer! !These people are objecting to adiyen’s only kainkaryam which is my only purpose of life ..Please do something that will not come in the way of my service to you . Nammazhwar pleased with his devotion appeared before Swami Madhurakavi azhwar in a disguised form. Dressed like an old man he asked Swami Madhurakavi azhwar about his reason for his grief. Swami repeated the story to the old man. The old man replied please do not worry about these trivial issues. 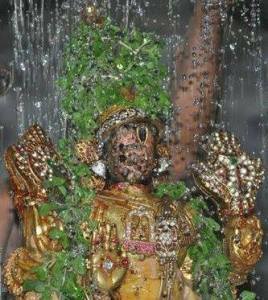 Submit this pAsuram of “kaNNan kazhaliNai…” and see the miracle “saying this he disappeared. “Kannan Kazhalinai” will support you always”. Madhurakavi obeyed as instructed and proceeded to Madurai to meet the so called great sangam poets . All of them were debating in a boat discussing the authenticity of the literature . Madhurakavi offered the holy verse to the poets . (Madhurakavi azhwar had offered the divine verses in a small leaf which was used during olden times and the divine verse “Kannam Kazhalinai…” from Thiruvaaimozhi was ever glowing )The poets read those verses and laughed at Swami Madhurakavi azhwar for his childishness and threw it aside . Suddenly the whole boat top sided all the poets much to their surprise .They swam hard and with great difficulty reached the shore. To their astonishment, they found that the boat retained only that palm leaf . The poets read it patiently and were of opinion that Swamy Nammazhwar was not any ordinary saint and apologised for their foolishness . Thus their ego was shattered Azhwar further says that For a true devotee of Lord Krishna …. all is Lord Krishna the Food – eaten to satisfy the appetite,water drunk to quench the thirst, the betel leaves consumed after the food, are all Lord Krishna . Chanting HIS holy name, speaking of HIS qualities, and thinking of HIM , HIS devotee will feel the hunger and the thirst and all other needs satisfied. They will not eat any other food since KRISHNA CONSCIOUSNESS is enough food for them and always remain in that bliss forever ….. It is also Appearance day of our Paramacharyar “Sri. Sreesailachariar ” of Mudaliandan Thirumaligai – the paramacharyar of the present acharyar, Sri Kandhadai Kumara Venkatacharyar(Ramanujar) . Swamy is the 22nd descendant in Mudaliyandan’s (Swamy Ramanujar’s nephew) lineage. Mudaliandan also known as Dasarathi-who is considered as reincarnation of Lord Rama was ordained to remain in Gruhastashrama (family life) by Swamy Ramanuja . He was the premier disciple of the 74 simhadipatis who were nominated by Ramanuja to continue Srivaishnava sampradaya, of them, few were sanyasis, others were gruhastas. Srisailacharyar’s father ,Sri Mudaliandan (the 21st descendant in the lineage) gave his son his father’s name to the child who was born on the auspicious day of Chitra Pournami in Chithra star. Glories to the acharyar who surrendered at the feet of Manavalamamunigal, Sri Dasarathi, the acharyar who stayed at Singaperumal kovil, Kanchipuram, Yadhugiri(Melkote), the one who attained Madhurakavigal’s position due to his acharyar bhakti. Lord Sriman Narayana’s lotus feet is glorified as Sri Satagopan (Swami Nammazhwar). Kidambi Achan was born in the village “Kidambi” located between Kooram and Thiruputkuzhi near Kanchipuram in the year 1057 A.D.in the tamil month of Chithirai on Hasta Nakshatara day in Atreya gothram. As Hastam is considered to be the star of Varadaraja Perumal, his parents named him “PRANATHARTHIHARAM”- as glorified by Thirukachi nambigal in the first sloka of Devaraja Ashtakam. He was the nephew of Tirumala Nambi’s wife (Swamy Ramanujar’s maternal uncle’s wife) and was thus related to Swamy Ramanujar like Mudaliyandan Swamy who had both atma sambhandham and deha sambandham with Swamy Ramanujar. He was one of the prominent disciples of Swamy Ramanujar who felt that acharyar kainkaryam was of utmost importance. Like Kooratazhwan and Mudaliandan, Achan also was a simple, devoted, highly knowledgeable person and was well versed with Thiruvaimozhi and Visishtadvaita granthas and was conferred the title “Vedantha Udhayana Acharyar” by Swamy rAmanujar. Like Vaduga Nambi, he considered serving his acharyar as the most important privilege . Being a sanyasi, Swamy Ramanujar used to go for alms (unjha vruthi) which was his varnasrama dharma (Brahmacharis and sanyasis must erk out living by taking alms ) reciting Thirupavai which earned him the name “Thirupaavai Jeeyar”. Few evil minded people in Srirangam who wanted to get rid of Swamy Ramanujar conspired a plan to mix poison in the biksha rice to be given to Swamy and forced a lady to offer it to Swamy Ramanujar. Unlike her husband, this lady revered Swamy Ramanujar but as she was threatened by her husband who was watching , she was left with no other option. With tear filled eyes, she hesitatingly offered the biksha to Ramanujar by ensuring to separate the contents in the bowl by placing a leaf on it and then offered her portion indicating to jagadacharyar that it was not worth consuming. Swamy understood her implication and threw away the bhiksha in Cauvery river. From that day onwards, Swamy abstained from unjha vruthi and hence he couldn’t take any food. Learning about this incident, Thirugoshtiyur Nambi who was one of the gurus of Swamy Ramanujar came to Srirangam. Learning about his acharyar’s arrival, Swamy Ramanujar along with his sishyas set out quickly to Kollidam to receive him. It was noon and in the scorching heat ,Swamy Ramanujar lay prostrate at the feet of his acharyar who did not ask him to get up. It is customary to fall at the feet of our acharyar like a stick and remain in the same position until the acharyar asks us to get up. The sishyas of Nambi and Ramanujar stood dumfounded as they were perplexed at Nambi’s behaviour (who was their acharyar’s acharyar) which they had never seen before. Unable to bear this, with tear filled eyes , Pranatharthiharan embraced Swamy Ramanujar lamenting as to how the delicate body of Swamy which is similar to a flower could be exposed to the scorching heat. He acted as a barrier by laying down on the ground to protect Ramanujar from direct contact of the sand. Thirugoshtiyur Nambi was very pleased with his acharyar bhakti. He instructed Kidambi to take care of Swamy Ramanujar’s bestowing him the privilege of offering bikshai and madhukaram to Swamy Ramanujar. He came to be known as “Kidambi Aachan”(Achan = father). As he had parental affection towards Ramanujar (like how Periazhwar had towards Perumal), he was fondly addressed as “Aachan”. As he was incharge of kitchen, he came to be known as “Madapalli Aachan” . He treated Sri Parasara Bhattar who was much younger to him with the same reverence he had for his acharyar as per his guru’s instructions. Once when Aachan visited Thirumaliruncholai, he was asked to render Alavandar’s stotra ratnam . 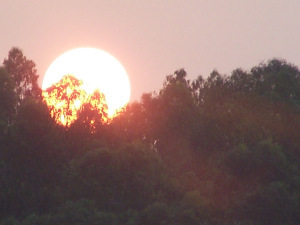 In the 48 th slokam, Alavandar states that ” he has no other refuge than Perumal”. Aachan paused here as he wondered how it could be true” When Perumal asked him, he replied that the statement is not true now as they all have “swamy Ramanuja as their protector ” who is the sole refuge of everyone. Azhagar was pleased with his unflinching devotion towards his acharyar. As expressed by Nammazhwar in Thiruvaimozhi, Achan also relished having darshan of Emperuman in various divya desams. When Swamy Ramanujar reincarnated as Manavala Mamunigal, he chose to learn the intricate meanings of Sribhashya from Kidambi Achan’s descendant named Kidambi Pillan. Mamunigal showed him his original Adisesha form to Pillan. Kidambi Achan was one of the seventy four simhadipatis authorised by Swamy Ramanujar to continue Srivaishnava sampradayam. Swamy gave him Hayagriva Perumal to him for worship. After Swamy Ramanujar left this mortal world, Kidambi Achan returned to Kanchipuram and left his body in the year 1157 -20 years Swamy Ramanuja attained paramapadam.